Successfully Added Resonance Speaker and iPod/iPhone Docking Station to your Shopping Cart. Revolutionize the way you listen to music - this Resonance Speaker transmits sound vibrations through hard surfaces, creating a rich sound enhanced by soft vibrations that allow you to actually feel the music. Also includes an iPod/iPhone Docking Station with audio amplifier for even more audio brilliance. Different from traditional speakers, this innovative Resonance Speaker produces sound by music vibrations resonating off any hard surface, such as your marble floor, wooden table, or glass windows. The vibration of the music then spreads out across the surface to bring an unbelievable audio experience with different surfaces creating different sound effects and moods. Combined with the crystal clear sound output and beautiful design, this Resonance Speaker was simply made to impress. Equipped with a 3.5 mm audio jack, simply connect this Resonance Speaker to your laptop, DVD player, MP3 player, or any other 3.5 mm compatible audio sources for instant music playback. 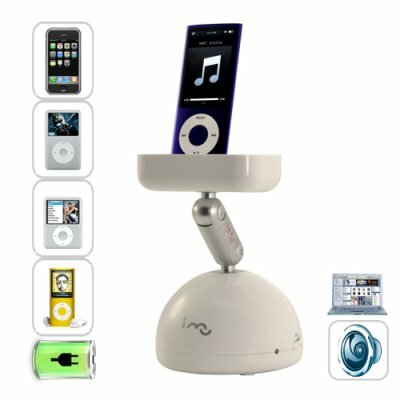 Apple fans can connect anything from an iPod Nano to an iPhone 3GS to the iPod/iPhone Docking Station, which is synced to the speaker and even charges the Apple device when idle. Also included is an audio amplifier - giving your music an even larger boost to the already brilliant performance. Using this product on iPhones may bring up the following message - This accessory is not optimised for this iPhone. You may experience noise caused by mobile interference and a decrease in mobile signal strength. Click on (dismiss) to ignore the message and everything will work fine. The Resonance Speaker noise is a bit low... is this normal? Adjust the volume using the volume control on the side. If it's still low, make sure the unit is properly situated on a flat and hard material, otherwise the vibrations will not reach the surface. No. Due to the powerful audio output, which cannot be delivered by rechargeable batteries, it is only usable with an AC adapter. This item is one of the best sound system i have ever heard,no distortion,pure music, and the look is space age,i put it on my bench and the sound was comming out of the wall's.